Last year, the Maine State title was snagged from the Men’s Track and Field team; they fell to Bowdoin by 43 points at their home track in Merrill Gymnasium. Flash forward one year and the tables have turned. On Saturday Feb. 2, in Gorham, Maine at the University of Southern Maine, the men came back superior, defeating Bowdoin by 41 points and securing the status of reigning state champions. Colby and the University of Southern Maine trailed in second and third respectively. 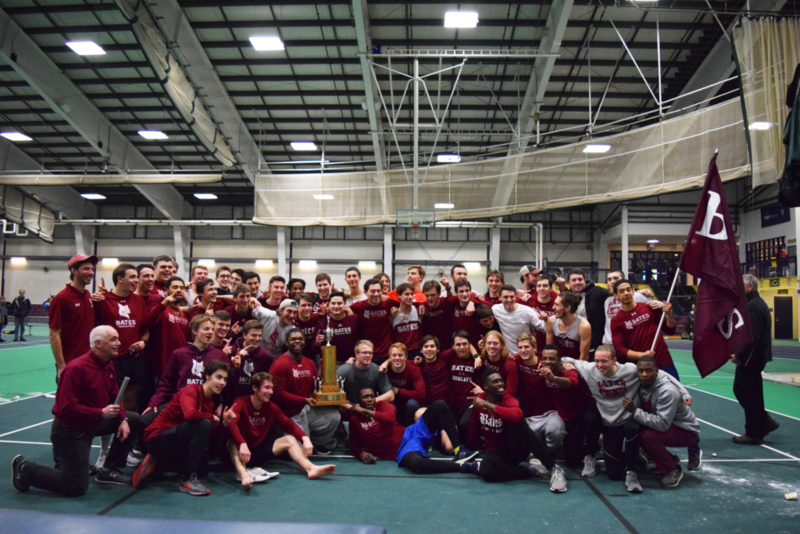 The Men’s Maine State Indoor Track Trophy will once more return to Merril Gymnasium after Bates’s decisive victory. This tremendous effort was driven by nine state champion titles. John Rex ’21 won both the weight throw and the shot put, Ryan Nealis ’21 clinched victories in the mile and 800m, Beaufils Kimpolo-Pene ’20 secured first in the high jump, James Jones ’20 won the 5,000m, Henry Colt ’19 took first in the 3,000m, senior captain Mark Fusco ‘19 sealed a victory in the 600m, and Jackson Elkins ’22 took the 1,000m. The 4x400m relay squad of Ryan Corley ’19, Frank Fusco ’19, senior captain Mike Somma ’19, and Miles Nabritt ’21 also ran to an exciting victory. As seen in this expansive list of champions, the team’s effort was earned by all class years, some even doubling in tough events. These victories epitomize the outstanding depth and determination of this team. The top five athletes in every event scored for their corresponding teams. In a meet as competitive as the State of Maine Championships, every point counts. Every event saw at least two or three Bobcats scoring within the top five positions. Zack Campbell ’19 finished second in the weight throw and fifth in the shot put, junior captain Brendan Donahue ’20 placed third in the triple jump, fifth in the long jump, and fifth in the high jump, while Nabritt, Ryan Giunta ’21, and Justine Levine ’20 clinched second in the 400m, 200m, and the 5,000m, respectively. “Everybody has been working extraordinarily hard for the last couple of months and it was great to see it pay off at states,” Assistant Coach Jacob Ellis said. Ellis, a Bowdoin graduate and turned Bobcat, coaches the mid and long-distance guys. “As coaches, we’ve known that our team is full of talent and among the best in New England and I think beating Bowdoin, USM, and Colby has helped our guys see that they can really compete with the top athletes in the region and beyond,” he continued. Per tradition, the infamous “Black-Out” 4x800m relay capped off the meet. During this relay, all the lights of the indoor facility are shut off stadium-style and the athletes compete in a darkened, high stakes setting. Elkins, Christopher Barker ’21, Ian Wax ’19, and Mark Fusco placed second in the relay, securing a well-deserved win for the Bobcats. The Bobcats have already kept up their stateswin momentum. The men competed at the Boston University Valentine Invitational on Saturday, Feb. 9 and saw several personal and season best times. They hope to keep making strides in this direction in the weeks leading up to the Division III New England Championships at the Massachusetts Institute of Technology on Feb. 22-23.